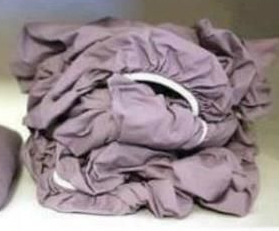 I think I'm the only person that randomly questions how to properly fold a fitted sheet at 10p on a Friday night. Yes, this is really my life and I'm truly this random. So, with the help of my wonderful e-friend and fellow blogger Gorgeous Puddin, she put me on to the amazeballs YouTube video below. Ahhh, the wondrous world of YouTube - - everything you wanted to know at the tips of your fingers. I could have probably just called my mom and asked her as she's somewhat of a renaissance woman. Seriously, the lady does it all from having been an RN to a paralegal, owning power tools and swearing by ironing her bed sheets lol... but leave it to YouTube to save me a phone call. So, for anyone that has ever wondered what in the entire hell to do with a flat sheet they were trying to store, look below and see the magic that is properly folding a fitted sheet! !